Milk powder manufacture is a simple process now carried out on a large scale. It involves the gentle removal of water at the lowest possible cost under stringent hygiene conditions while retaining all the desirable natural properties of the milk – colour, flavour, solubility, nutritional value. Whole (full cream) milk contains, typically, about 87% water and skim milk contains about 91% water. During milk powder manufacture this water is removed by boiling the milk under reduced pressure at low temperature in a process known as evaporation. The resulting concentrated milk is then sprayed in a fine mist into hot air to remove further moisture and so give a powder. Approximately 13 kg of whole milk powder (WMP) or 9 kg of skim milk powder (SMP) can be made from 100 L of whole milk. The conventional process for the production of milk powders starts with taking the raw milk received at the dairy factory and pasteurising and separating it into skim milk and cream using a centrifugal cream separator. If WMP is to be manufactured, a portion of the cream is added back to the skim milk to produce a milk with a standardised fat content (typically 26 – 30% fat in the powder). Surplus cream is used to make butter or anhydrous milkfat. several minutes (cf. pasteurisation: 72_C for 15 s). Preheating causes a controlled denaturation of the whey proteins in the milk and it destroys bacteria, inactivates enzymes, generates natural antioxidants and imparts heat stability. The exact heating/holding regime depends on the type of product and its intended end-use. High preheats in WMP are associated with improved keeping quality but reduced solubility. Preheating may be either indirect (via heat exchangers), or direct (via steam injection or infusion into the product), or a mixture of the two. Indirect heaters generally use waste heat from other parts of the process as an energy saving measure. In the evaporator the preheated milk is concentrated in stages or “effects” from around 9.0% total solids content for skim milk and 13% for whole milk, up to 45-52% total solids. This is achieved by boiling the milk under a vacuum at temperatures below 72_C in a falling film on the inside of vertical tubes, and removing the water as vapour. This vapour, which may be mechanically or thermally compressed, is then used to heat the milk in the next effect of the evaporator which may be operated at a lower pressure and temperature than the preceding effect. Modern plants may have up to seven effects for maximum energy efficiency. More than 85% of the water in the milk may be removed in the evaporator. Evaporators are extremely noisy because of the large quantity of water vapour travelling at very high speeds inside the tubes. 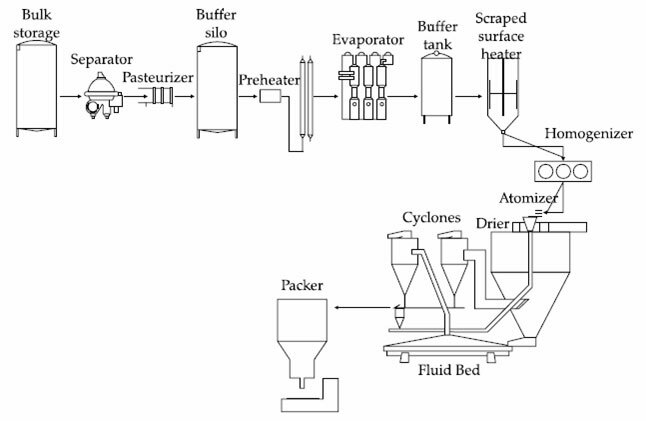 Spray drying involves atomising the milk concentrate from the evaporator into fine droplets. This is done inside a large drying chamber in a flow of hot air (up to 200_C) using either a spinning disk atomiser or a series of high pressure nozzles. The milk droplets are cooled by evaporation and they never reach the temperature of the air. The concentrate may be heated prior to atomisation to reduce its viscosity and to increase the energy available for drying. Much of the remaining water is evaporated in the drying chamber, leaving a fine powder of around 6% moisture content with a mean particle size typically of < 0.1 mm diameter. Final or "secondary" drying takes place in a fluid bed, or in a series of such beds, in which hot air is blown through a layer of fluidised powder removing water to give product with a moisture content of 2-4%. Precautions must be taken to prevent fires and to vent dust explosions should they occur in the drying chamber or elsewhere. Such explosions can be extremely dangerous to life, property and markets.